(Nanowerk News) Metal catalysts, with their ability to both speed up chemical reactions and influence product structures, have revolutionized manufacturing of essential goods such as petroleum and pharmaceuticals. The constant search for new catalysts that can improve existing methods has spurred chemists to investigate a relatively unknown part of the periodic table—the rare-earth elements. Rare earths, named for the uncommon minerals in which they were first discovered, possess remarkable chemical properties owing to their internal electronic configuration. Now, Zhaomin Hou from the RIKEN Advanced Science Institute in Wako and colleagues have used an yttrium-based rare-earth cluster to generate a new series of complexes that hold vital structural clues towards improving catalytic reactions ("Reduction of Transition-Metal-Coordinated Carbon Monoxide by a Rare-Earth Hydride Cluster: Isolation of Well-Defined Heteromultimetallic Oxycarbene, Oxymethyl, Carbene, and Methyl Complexes). Hou and co-workers studied one of industry’s most critical reactions: the reduction of carbon monoxide (CO) molecules attached to transition metal catalysts. In this process, a reagent known as a hydride causes CO to gain electrons or hydrogen, producing useful liquid hydrocarbons. Scientists know little about the mechanism of this reaction, however, and industry greatly desires more efficient catalysts. First, Hou’s team developed a new molecular rare-earth hydride—a large cluster containing several yttrium, hydrogen, and organic groups—to investigate CO reduction. According to Hou, the rare-earth hydride is extremely reactive towards molecules with triple bonds such as CO. Figure 1: Schematic showing that a rare-earth yttrium hydride (Y–H) cluster reacts with a rhodium–carbon monoxide (Rh–CO) complex to give a new organic–multimetallic species, accompanied by cleavage of the C-O triple bonds. When mixed together, the rare-earth hydride incorporated the metal–CO complex into its own framework, creating structurally well-defined organic–multimetallic molecules with various degrees of CO reduction. The researchers believe that these new hybrid compounds are important intermediates in the transformation of CO into hydrocarbon molecules. They also found that different metal–CO complexes generated unique structures with the rare-earth hydride. For example, tungsten–CO complexes added to the yttrium cluster as intact units by bonding oxygen atoms to yttrium sites. 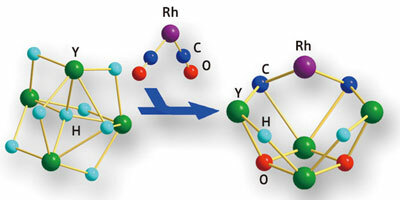 With a rhodium–CO complex, however, the C–O bond is cleaved after addition; carbon groups joined directly to yttrium while oxygen atoms moved deeper into the cluster framework (Fig. 1). The ability of rare-earth hydrides to capture ‘snapshots’ of catalytic reactions through an extraordinary variety of metal, carbon, and oxygen bonding interactions promises to spark development of better organic synthetic techniques, a prospect that Hou and colleagues are actively investigating.